Proterozoic Orogens of India: A Critical Window to Gondwana provides a unique opportunity to understand a cross-section of the well-exposed and best-studied part of Earth’s crust and the processes of continental collision. It covers pulses of reworking processes and their impact on magmatism, metamorphism and deformational history of Proterozoic orogens vis-à-vis the supercontinental formation. The details of structural architecture, crustal blocks, shear zone systems, magmatism, metamorphism, geochemical and isotopic signatures, mineralization and tectonic models of all the Proterozoic orogens of India are discussed along with excellent illustrations reflecting the field-based, multi-scale structural and geological data sets. The spatial distribution, geometry, kinematics and transpressional strain of the shear zone systems (mostly suture zones), which are critical to all conceptual models dealing with tectono-metamorphic history of Proterozoic orogens of India, are also covered. 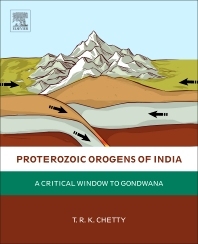 The book summarizes and integrates the state-of -the art understanding of the structural architecture, lithological assemblages, petrological, geochemical, geochronological and geophysical aspects of the Proterozoic orogens of India. Geoscientists especially geologists, geochemists, geophysicists, seismologists, and all students, academicians and professionals of Earth System Sciences, whose interests lie in understanding Tectonics, Mineral resources, Natural hazards etc,. Dr. T.R.K.Chetty has initiated and perfected, at CSIR-National Geophysical Research Institute, a rewarding methodology in structural mapping of large areas with Satellite images in different segments of Precambrian orogens of India. His focused efforts for over 4 decades led to seminal contributions in understanding the structural architecture and tectonic evolution of Proterozoic orogens of India that revolutionized conventional thoughts and provided profound influence in all geoscientific interpretations. He discovered shear zone systems that led to several innovative ideas and modern concepts like collage of juxtaposed terranes, Proterozoic flower structures, transpressional tectonics, constrictional deformation, dismembered ophiolites and collisional processes , which are acknowledged nationally and internationally. He led many international collaborative projects with the scientists from Germany, France, Russia, Australia and Japan.He was a visiting professor and delivered lectures in many Universities abroad. He was responsible for the discovery of soil covered rich Diamond bearing Kimberlite in 1986 and the novel concepts proposed by him provided an impetus for Kimberlite exploration in India. Dr. Chetty is honored with INSA-Royal Society Visiting Professor, 1987; INSA-JSPS Fellowship, CSIR-DAAD (Senior) Fellowship, 1997; Fellow of Andhra Pradesh Academy of Sciences; and visiting professor in many universities in India and abroad. Dr.Chetty is a recipient of National mineral Award (2006), Australian Endeavour Executive Award (2008) and is the first Indian to be elected as the President, International Association of Gondwana Research (IAGR). "However, what makes this book particularly enjoyable is its language. The book is an excellent read, and is written in an extremely lucid manner.